Your exact application will be developed according to your needs to guarantee adherence to your SOP. The following examples show the benefits LabX brings you to any of your weighing applications. In less than four minutes you can easily prepare accurate standard and sample solutions, fully labeled and traceable, with comprehensive SOP user guidance and your results printed in a personalized report. Perform Loss on Drying and Residue on Ignition analyses easily with comprehensive SOP user guidance on the balance, fully tracked samples, all data and calculations handled automatically, and your results printed in a personalized report. Using automatic weight detection, sieves can be weighed consecutively without needing to touch a button. 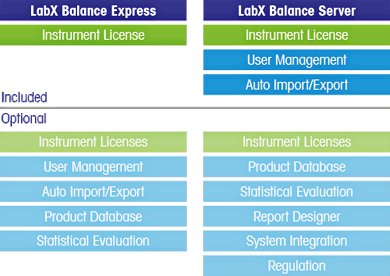 LabX provides clear step-by-step instructions on the balance, and automatically takes care of all data and calculations. The complete solution can be tailored to match individual process requirements. In this semi-automated process, the operator simply adds the tablets to the feeder and follows the instructions on the balance touchscreen. LabX takes care of all data and performs all necessary calculations and analyses to ensure full traceability.